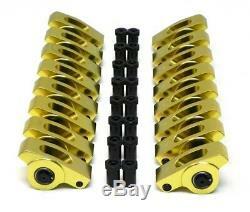 Small Block Chevy Aluminum Roller Rockers. 1.50 ratio, 3/8 stud (23 degree stock/aftermarket heads). Maximum Race series Aluminum Rockers. Made from high strength 6061-T6 aluminum extrusions, each piece is precision CNC machined and finished by hand to ensure that our customers receive the very best KMJ has to offer. KMJ stud mount aluminum rockers are specially machined to allow for larger springs and retainers with full-cage friction reducing needle bearings for added durability. The nose rollers and shafts are Cr40 steel, heat-treated and hardened to minimize the wear that naturally occurs between the roller tip and the valve stem. All KMJ aluminum rockers come complete with poly locks at no additional cost. Designed to meet the demands of most high-lift roller camshaft profiles. Specially machined to accommodate larger valve springs and retainers. SAE-52100 Full complement precision needle and cage roller bearings. Anodized for a superior finish and to reduce operating temperatures. CNC machined pushrod cups and heat-treated Cr40 roller tips. Internal oiling system for long lasting performance. Clears most centerbolt covers (depending on the inside of the cover). CHEVROLET Small Block Gen I. Note in picture the clipped ends of the roller pin. I have seen many sets that are already cracked in the box. We said enough was enough!! We were tired to the junk coming to us that was already broken in the box. If the quality controls were not in place to make sure the rocker arms were not cracked before they went into the box what was really happening during production. Most wont even handle a moderate hydraulic camshaft. This is because they are die cast out of cheap aluminum instead of a 100% extruded aluminum. We went on a mission to find the highest quality extruded aluminum roller rocker arms available to us. We found the manfacturer who manufactures for another very well branded company. Lots of profit for sellers not to profitable for you as the customer!!! As the old saying goes a picture will say a 1000 words. Please study the pics very closely what we are trying to provide you is a comparison of the competitors rocker arms and what we are offering. The captions of the pics will point out the differences. Most other sellers may take wonderful pics of their own and make claims that are in their opinion uncontested. We want to show you them side by side and then let you make the decision. They are all nice and shiney and take good pics but they are not all equal! The 4th and 5th one are identical expect in color. Remember we had to make them a different color!! Check out the retainer clips on our beefy roller tip pins. The beefy pin and retainer clips cost more but ensures that at high RPM and pressure that the pins will not work themselves out. If you have raced enough you probably have heard of these pins walking out. Some racers don't even notice that it was the pin that came out that destroyed their engine. They think they simply dropped a valve. Here is what happens with the small press pinned design. The pin comes out and shortly after the rocker arm is simply riding on the spring retainer. The valve tip gets pressed into the area the pin and roller should be. The piston ends up catching up to the valve and smacks the valve possibly breaking the top of the piston or busting the valve and sending it into the head and shortly after you have a fireball. Check out the roller tip oiling holes. The two on the left are OK but they are a little high to ensure proper oiling. The third one is completely unacceptable as it is highly unlikely it will ever get any oiling. The fourth and 5th one have the hole in the proper postition to ensure that the roller tip and the valve tip get the oil they need to reduce friction and fatigue. Above is our packaging with a reuseable tray. To prevent any delays with your order you should watch for the following common issues. Addresses that only have a PO Box can cause long delays and almost always result with having to credit/cancel the order in the end. If the ord er requires multiple packages someone will need to sign for each one. Some items are not combined due to size or weight such as crankshafts, torque converters, radiators, cylinder heads, etc. Powered by SixBit's eCommerce Solution. The item "SBC Small Block Chevy 327 350 400 Aluminum Roller Rockers Arms Kit 1.5 Ratio 3/8" is in sale since Tuesday, October 9, 2018. This item is in the category "eBay Motors\Parts & Accessories\Car & Truck Parts\Engines & Components\Rocker Arms & Parts". The seller is "kmjperformance" and is located in Story City, Iowa. This item can be shipped to United States, Canada, United Kingdom, Denmark, Romania, Slovakia, Bulgaria, Czech republic, Finland, Hungary, Latvia, Lithuania, Malta, Estonia, Australia, Greece, Portugal, Cyprus, Slovenia, Japan, China, Sweden, South Korea, Indonesia, Taiwan, South africa, Thailand, Belgium, France, Hong Kong, Ireland, Netherlands, Poland, Spain, Italy, Germany, Austria, Bahamas, Israel, Mexico, New Zealand, Philippines, Singapore, Switzerland, Norway, Saudi arabia, Ukraine, United arab emirates, Qatar, Kuwait, Bahrain, Croatia, Malaysia, Brazil, Chile, Colombia, Costa rica, Dominican republic, Panama, Trinidad and tobago, Guatemala, El salvador, Honduras, Jamaica, Viet nam, Antigua and barbuda, Aruba, Belize, Dominica, Saint kitts and nevis, Saint lucia, Barbados, Brunei darussalam, Bolivia, Ecuador, Iceland, Jordan, Cayman islands, Sri lanka, Martinique, Nicaragua, Oman, Peru, Pakistan, Paraguay, Uruguay.